Another year is gone and once again it's time for our Once a Year Sale. We'll have reductions of up to 75% throughout the store. For example our handmade Italian table lamps from Vietri are 25% off. Also from Vietri are beautiful blue & white Italian ginger jars reduced 50%. 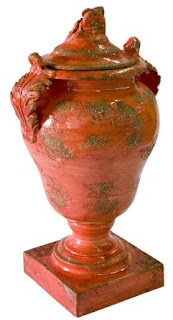 There are specials on some of our other Italian pottery, too, including the beautiful new persimmon color from Fortunata. There are a few select pieces for fans of Julia Knight including all her glassware at 50% off. We never have Julia's pieces on sale, but this year we've decided to offer special pricing on a some designs that Julia has decided to retire as well as a few pieces that are less than perfect. We're also including retired pieces from Michael Aram. There's special pricing on discontinued patterns in French linens from Le Jacquard Francais. 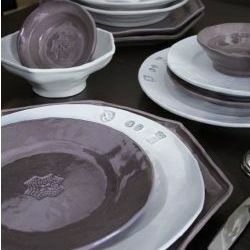 Also included are select pieces of Juliska, Match, Vietri, and Arte Italica Dinnerware. All remaining Atticus trays are reduced 50%. We even have a couple of pieces of Jan Barboglio and Theresa Seidel on sale. For those of you who know Jan's and Theresa's works you know these never, ever get reduced! There are lots and lots of decorative pieces throughout the store. Candleholders, vases, serving pieces - practically every category we carry. Friday is a special preview day for our best customers and our social media fans. We'll start advertising the sale Saturday so come in early.